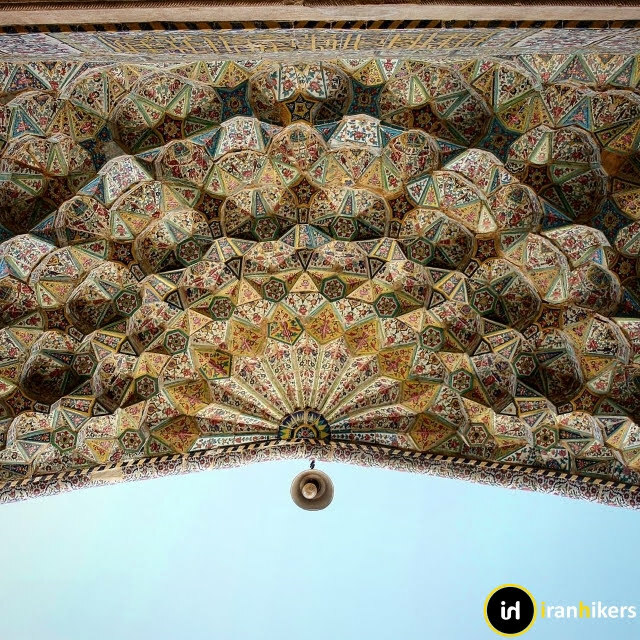 At first glance, you will notice the architecture and design of vakil mosque, a plan that displays a tangible harmony between the worldly beauties and the religious and culture of the people of that time. The mosque is based on the traditional architecture of this mare and is located in a social complex. 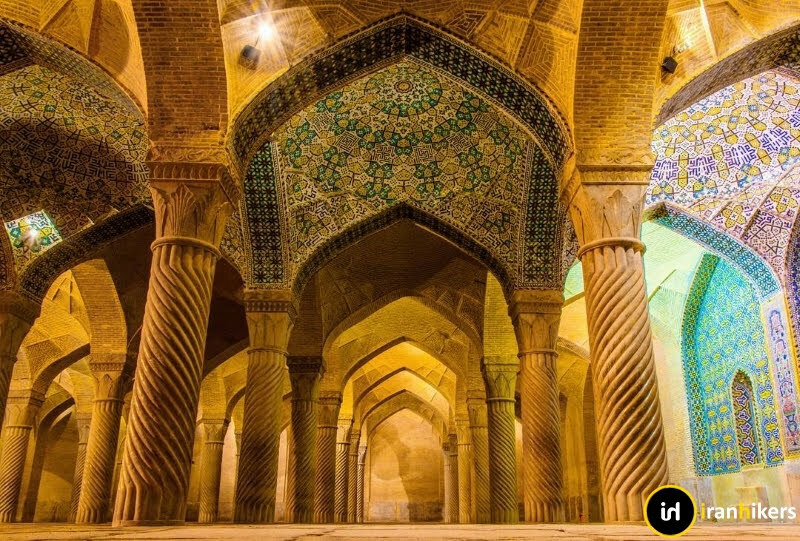 The simplicity of the images and architectural lines used in making this mosque is also admirable, and the use of Iranian colors and arts on walls and sections has created a fantastic collection. 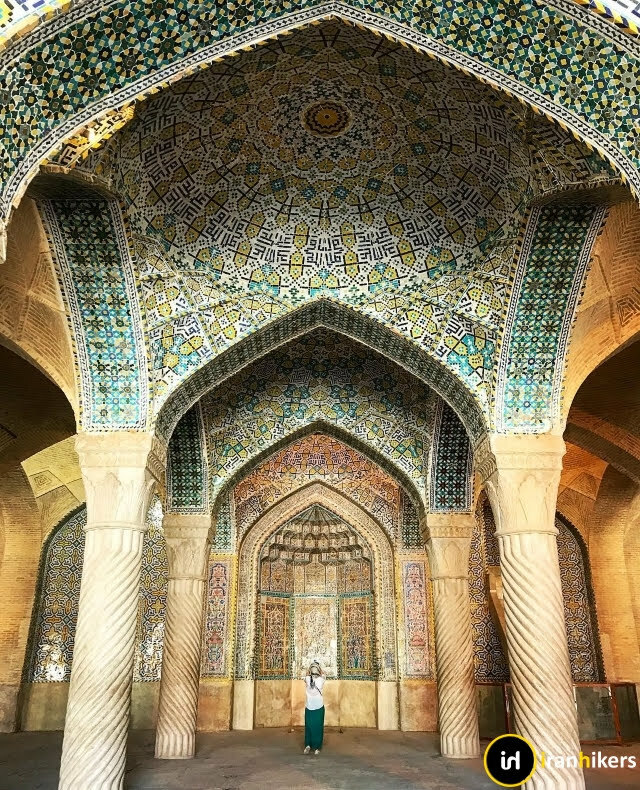 With a variety of beautiful colors and pearls on the walls and portions of this vast mosque, we will face a spectacularly impressive collection. A collection that looks like a lazium and turquoise palace. 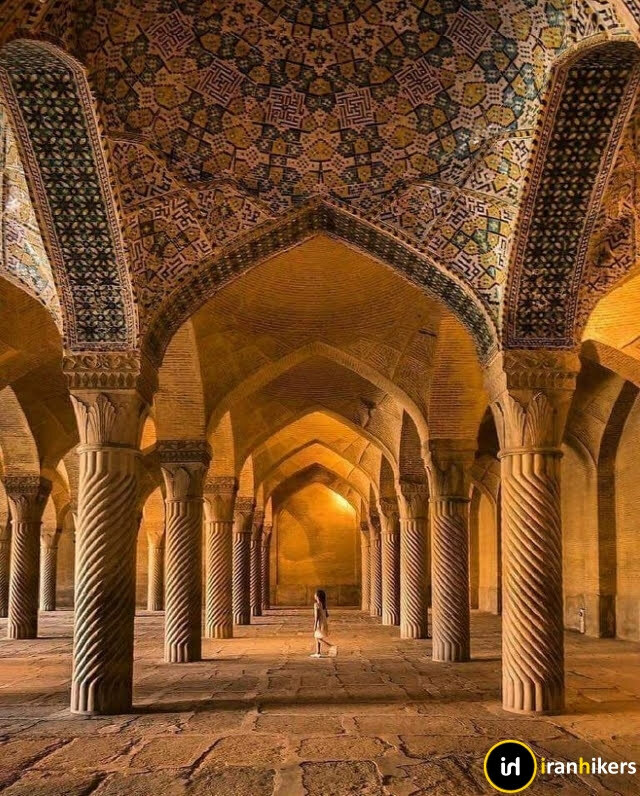 The vakil mosque is one of the most beautiful Iranian architecture with two porches with two south and eastern shrines, and it reminds of Karim Khan Zand's rule in this region. This mosque has two eastern and southern porches. The architects of the mosque, in order to match the qibla of the mosque with the Shiite qibla, and on the other hand, the mosque's facade is in line with the market's suburbs and the market itself; the corridors are connected to the courtyard of the mosque, which is not clear at the same angle of the pitch. 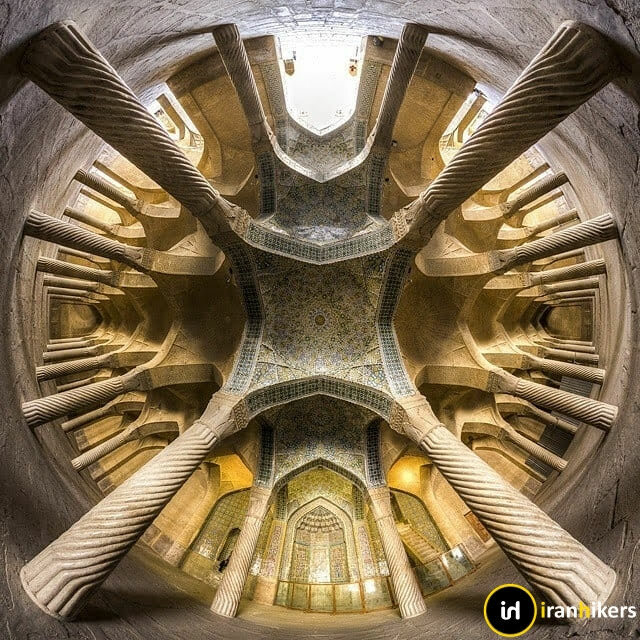 This level of accuracy in architecture has been admirable in a period that has been the culmination of Iran's rise in architecture. The vakil mosque does not have a dome and all the nursery springs are of a size. This suggests that there is no difference between the nesting positions. Namelessly, the distances and differences in the position of the people towards the Shah and Karim Khan's tendency to bring the ruling position closer to the masses of the people. 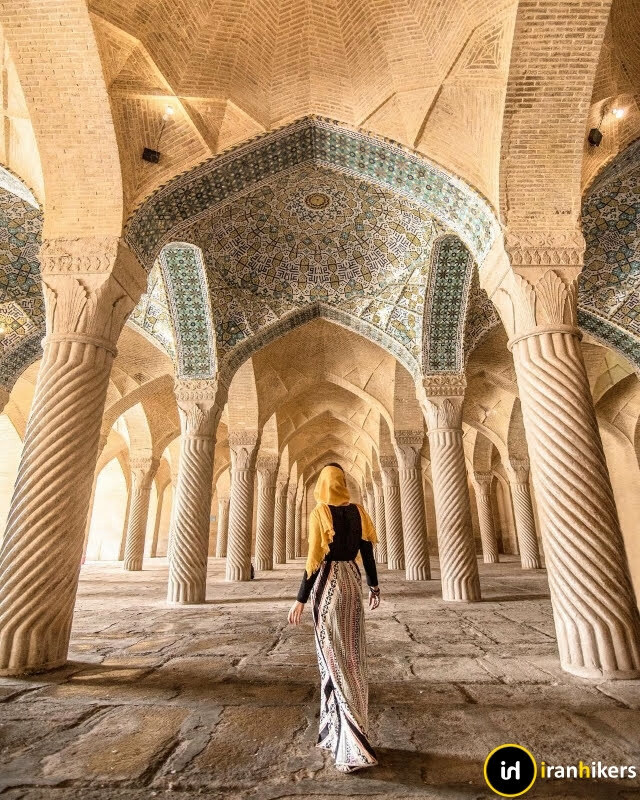 One of the most beautiful parts of this mosque is its southern hut, with 48 Spiral Pillars of monolithic stone, adjoining these Pillars with spectacular displays of Iranian architecture.The nursery has an area of about 5,000 square meters, and alongside its altar, the 14-pillar, Marble Minbar has added to its beauty. 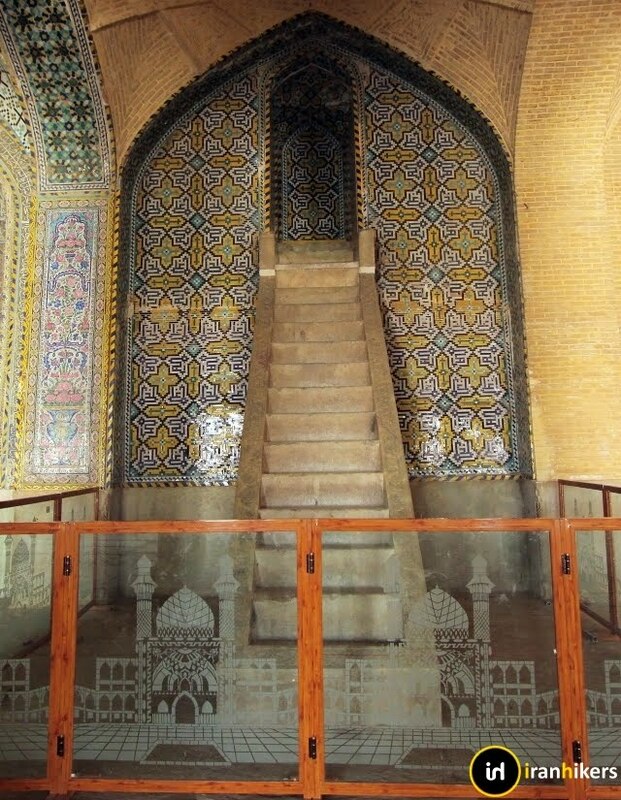 The Marble Minbar is said to have been taken from Maragheh to Shiraz on the order of Karim Khan to be used at the mosque. The "Pearl Arch" is the most famous part of the Vakil Mosque,which located on the northern side, and one of the Qur'an's suras is written round it up to the third perfect font. 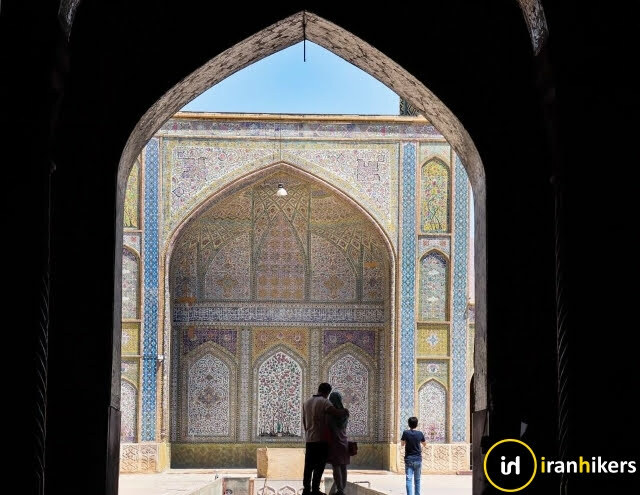 The interesting colors of the tiles of the forefront of the arches and gates of the Shiraz Vakil Mosque have been given in the form of tiled tiles, with slavic designs, bergamot and beautiful flowers. 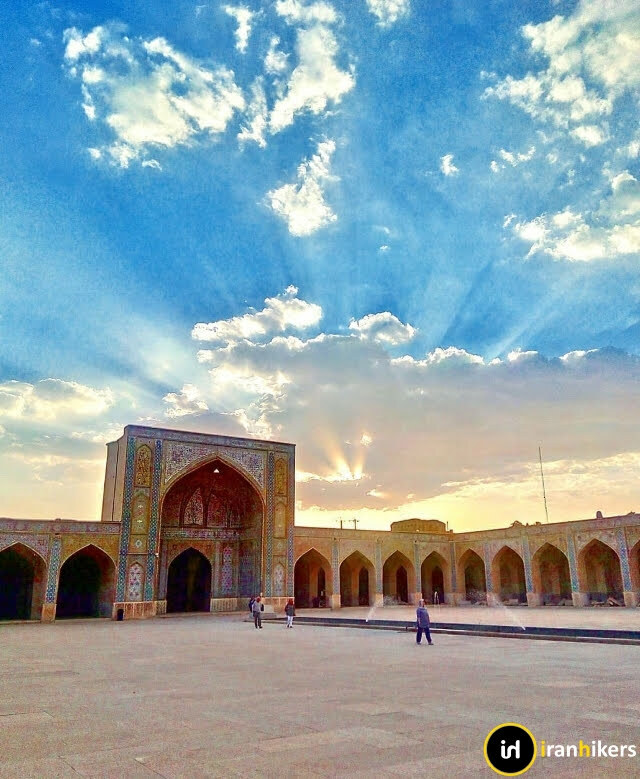 The courtyard of the mosque is built with large gems and is a rectangular square. The yard has dimensions of 60x65 meters. Large ponds with dimensions of 40 by 5 meters in the middle of it are made of large stone pieces. 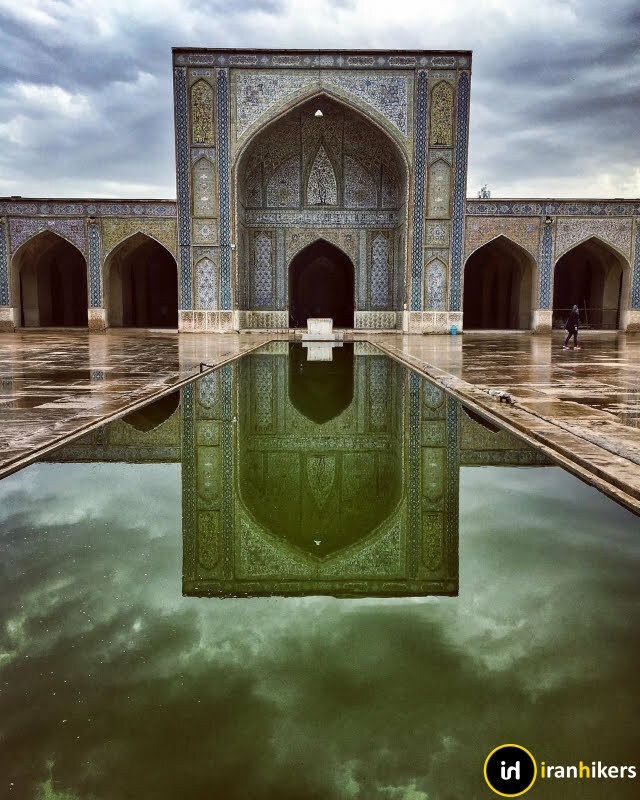 In the northern part of the courtyard of the mosque, we get a small courtyard with stone ponds of 7 × 12 meters in length. The length of this courtyard is 35 meters and its width reaches about 20 meters. Access to this courtyard is possible through a corridor. Tile works performed in different parts of the mosque are very beautiful and remarkable in their kind. The altar constructed on this nest reflects the art of architecture and designers of the Zandieh era, with a roof overlaid, and the words written on the tiles in the middle of the altar are very lovely. 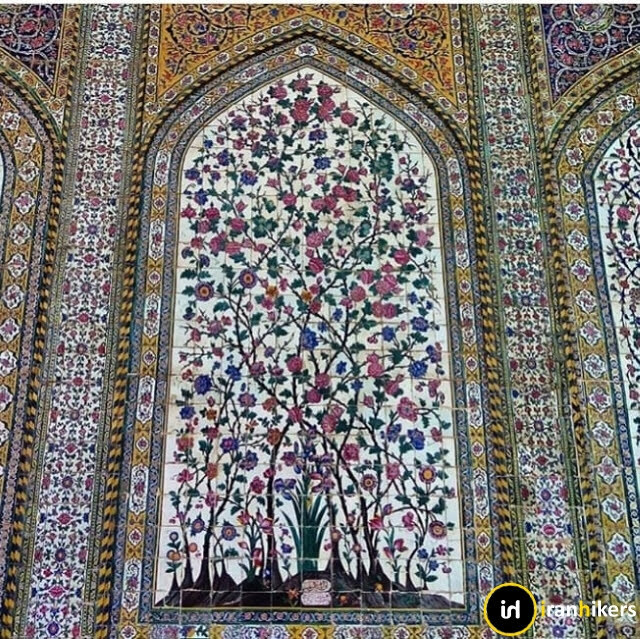 Art that is seen in most of the historical and Islamic monuments of Iran is tiling. At the lawyer's mosque, this work is done with tints in eye-catching colors, using seven-tone tiles and a lot of admiration. Southern and Southern porch and tile tiles are of seven colors and mosaics. It is not a bad thing to know that most of the tile decoration of the mosque belongs to the era of Fath Ali Shah and Nasir al-Din Shah. 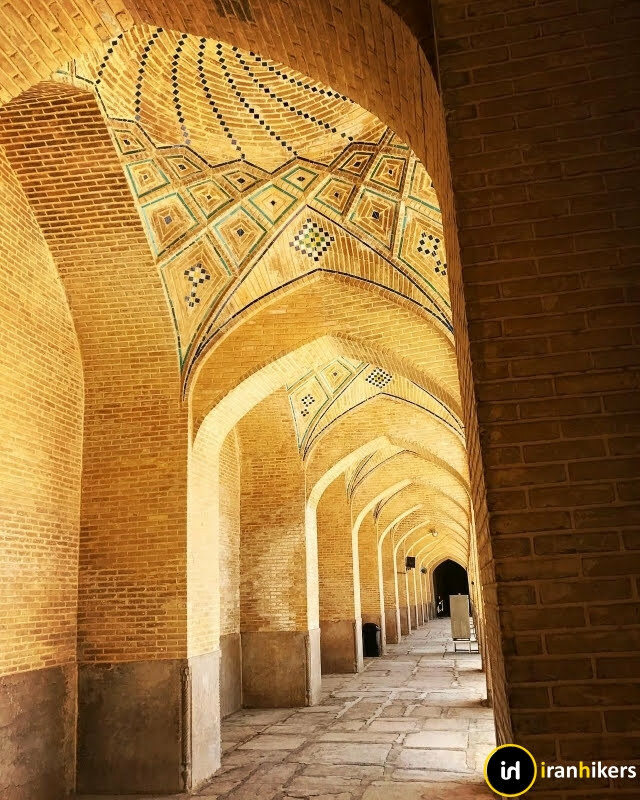 Historical evidence of two severe earthquakes after the Karim Khan period is announced and talk of the destruction of its reconstruction and reconstruction by the Qajar kings. 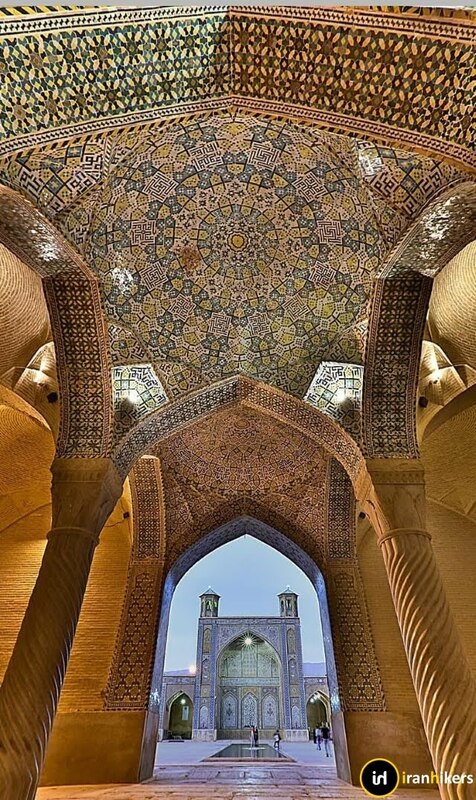 It seems that the mosque did not have any tile during Karim Khan's time, and Qajar kings used this art in the mosque. Carvings are the art of masonry, scribing, and rock bumps or tombstones. At the vakil mosque beautiful Pillars decorated with this art and have become one of the most prominent parts of the mosque. There are numerous inscriptions in the mosque of the attorney, which are written with lines of Nastaliq, Nashkh and Thyllis, and they are of special beauty and elegance. Thousand lines of arches and altar inscriptions written in bold are the most magnificent inscriptions of this mosque. The high value of Enamels art is not covered by anyone. This art is seen everywhere in the attorney's mosque, and you will not see any part of the wall without a pill. Pink and green and red colors have added to the magnificence of this mosque.